Smoke bombs. Sage green bridesmaids dresses. Semi-naked drippy cake. 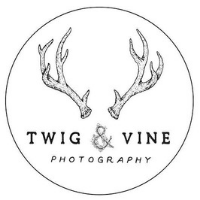 This wedding should be graded ‘S’ for swoon. I’ve fallen head over heels for this cute couple and their industrial-inspired wedding day, which is packed full of thoughtful decorative details. We’re talking a DIY doughnut wall, Chinese paper fans, and tear-jerking personal touches including a photo charm of the bride’s late father attached to her bouquet and cufflinks with photos of the groom’s late father and grandfather. I also adore the florals, with dusky pink roses, white peonies, sweetpeas, coffee-coloured phlox and foliage. Dreamy. And then there’s that dress, with its beautiful Bardot neckline and buttons all the way down the back. Utterly divine. 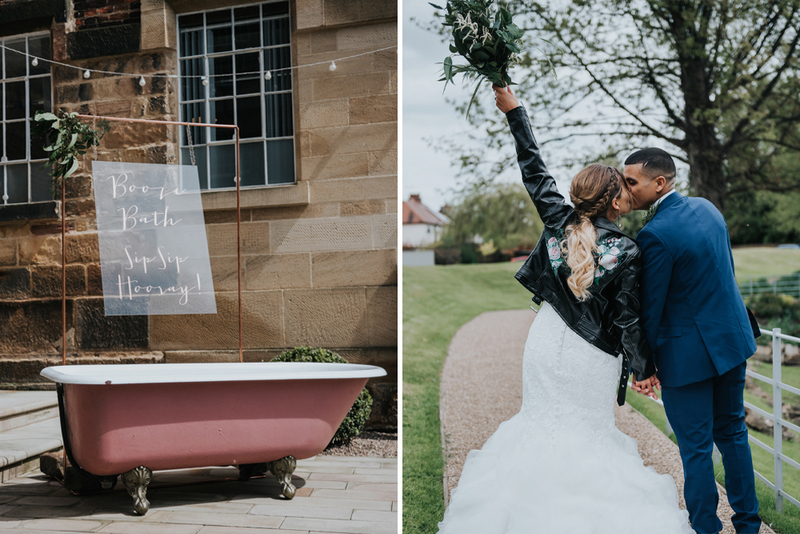 I don’t know about you but I want to jump right into the pink roll top booze bath at this industrial wedding at The West Mill in Derbyshire. A lovely focal point and a great way to display all the alcohol. The amazing decor doesn’t stop there. There are copper frames with perspex signs, moss-covered table numbers on tree stumps, and not one but three beautiful wedding cakes covered in gold leaf. The chalkboard sign accompanying them made me chuckle too. Both Leanne and Matt look super fierce in their wedding attire, with Leanne adding a fabulous customised leather jacket to her bridal look. 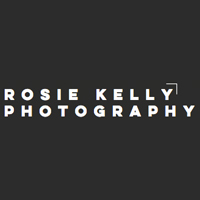 Every image captured by Rosie Kelly of them and their wonderful wedding will have you gushing with love and searching for the PINterest button! 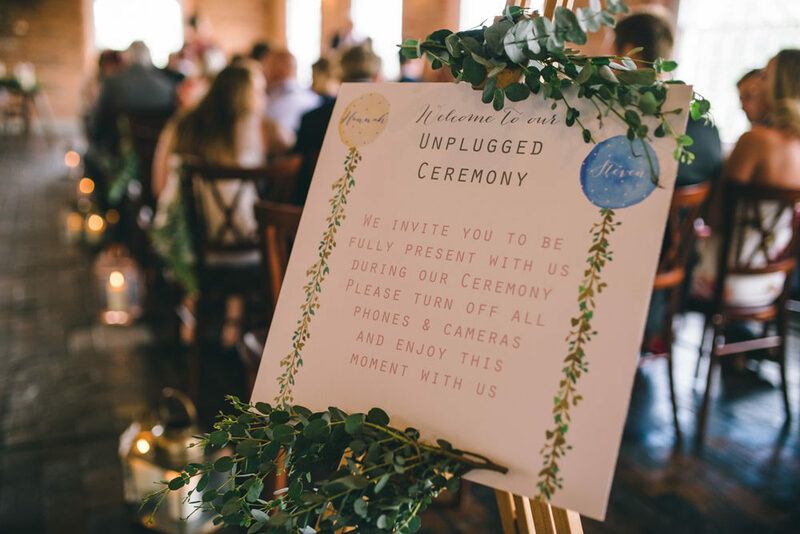 I love that our gorgeous couple Hannah & Steve chose to have their wedding ceremony unplugged, even better that it was illustrated by a truly gorgeous wedding sign created by the bride herself. But is it any wonder when she runs a fabulous stationery business: Yellowstone Paper Works. She even hand painted each and everyone of her guests their own place setting. SOO special. Also incredibly special are the ladies bespoke outfits by Mariée. The bridesmaids grey tulle skirts and the brides lace dress are exquisite. Teamed with pink peony and peach David Austin Rose bouquets and you have one beautiful bridal party. 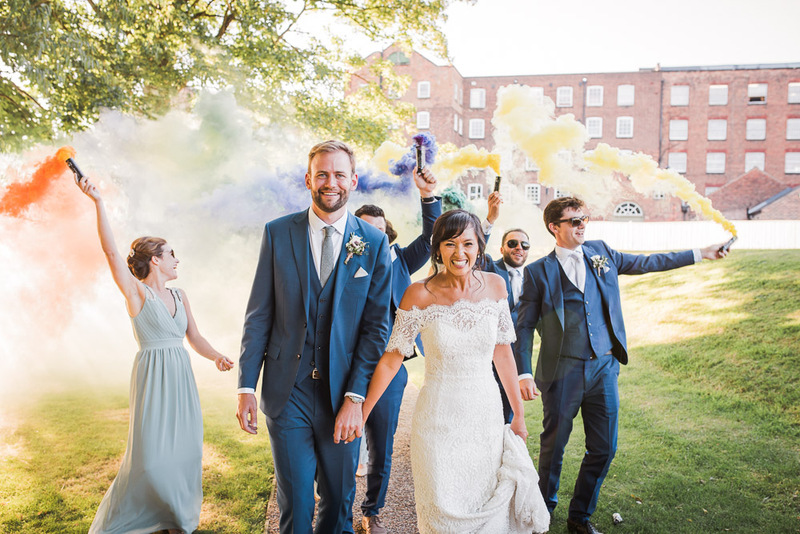 Everything about this wedding at The West Mill in Darley Abbey, Derbyshire is sentimental, pretty and captured to perfection by Matt Brown Photography and Lara Elliott films. Enjoy every moment.